ECU Joondalup under 18’s have won their second game of the season after a hard fought 3-2 win against Balcatta. Corey Hyde (Right) gave the youngsters the lead after only two minutes finishing clinically after racing clear. It was 2-0 on 14 minutes, John Hulme racing down the left, before cutting inside and firing low past the keeper. Balcatta keeper Josiah Godfrey was in fantastic form and he produced a stunning save to deny Ollie Annis a third before the break. Balcatta levelled in the opening minute of the second half, Tim Higgins on target and Higgins added a second ten minutes later turning home Brennan Borzecki’s cross. But ECU won it on 78 minutes, Jacob Jones’ corner was headed home by Neil Gillies. “Happy with the win, but we made hard work of it in the second half, but it’s good for the lads to get the three points after all their efforts in recent weeks,” Coach Paul Welch said. 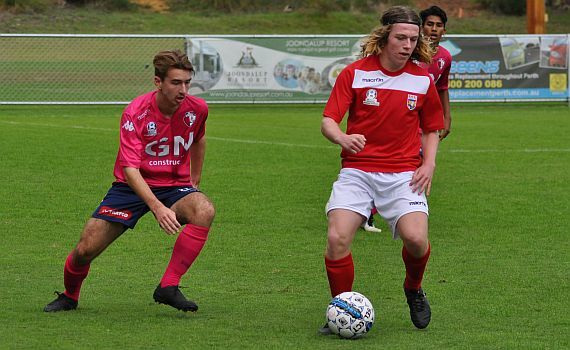 ECU Joondalup under 20’s were beaten 2-3 against Balcatta, the visitors winning the game with a last minute strike. Kyle Murphy gave the home side the lead on the half hour, but Balcatta levelled before half time through Ali Nazary. But the Jacks hit back and Jaedon Ewen regained the lead with a stunning shot from the edge of the penalty area. Balcatta levelled on the hour through Scott Newland, and it looked like the teams would share the spoils but a stoppage time shot from Carlo Coelho won it for the visitors.